I buy in bulk. I buy on sale. I buy in bulk when things are on sale. I’ve tried cutting coupons and waiting until the item goes on sale to use it, etc. It took several hours each week, and usually the item was sold out when I got to the store. I also found that most coupons were for processed foods or things that came in such small quantities that they did me little good. So I went back to my old plan, buying in bulk. I guess it’s no surprise that I shop this way with ten mouths to feed, but I really believe that this way of shopping saves a lot of money in the long run no matter how big your family is. 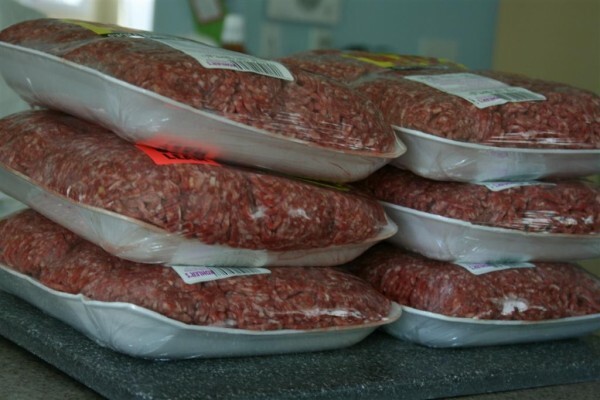 Yesterday I came home with 30 pounds of ground beef. I paid $1.69/lb for it. That’s more than I paid last time I purchased it, but the cost of food has risen sharply since I bought it 6 months ago, and it’s the best I’ve seen in a while. 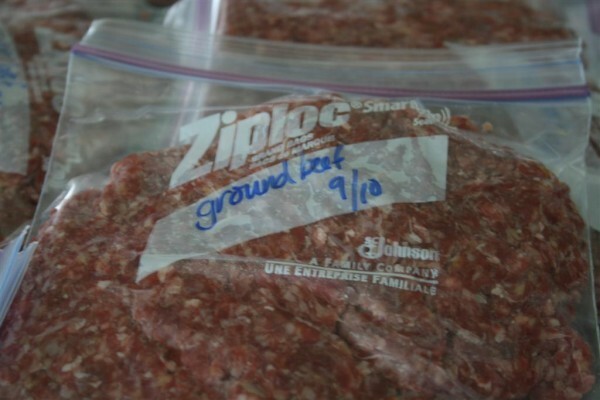 Plus, we were down to 7 pounds in the freezer. Thirty minutes later it looked like this. 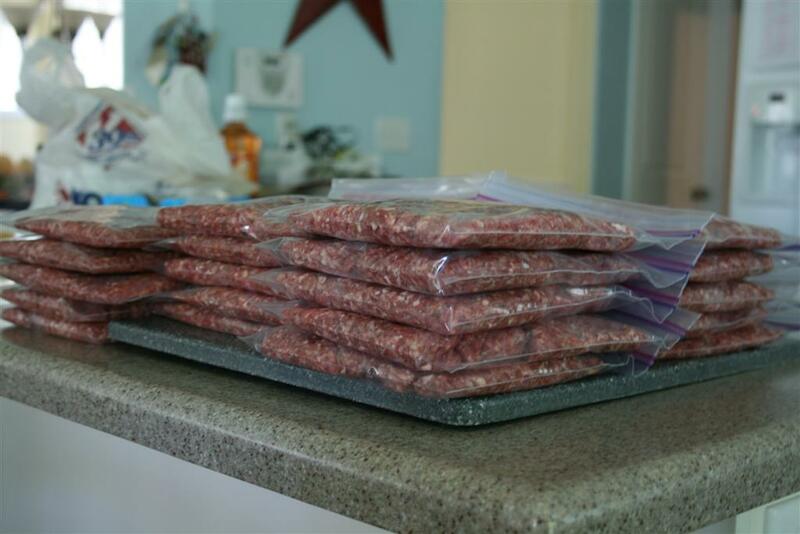 I’ve learned to lay the bag flat as I squeeze out the air to seal it, and while doing that I spread the ground beef into a long flat rectangle. Not only do they store well like this, but they thaw much faster this way too! I label and date each bag. 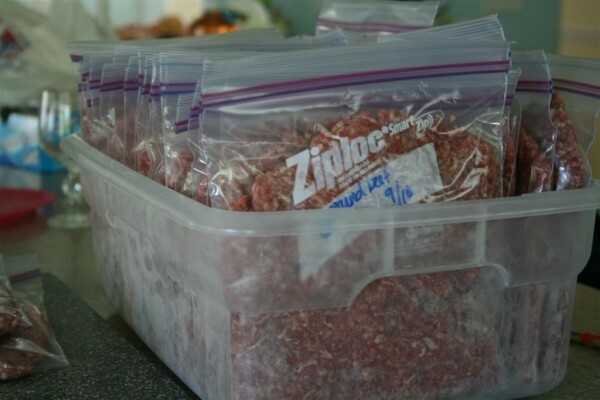 Because I hate digging through a freezer full of stuff that falls out and ends up everywhere, I use containers to hold similar items together in one area of the freezer. Doing this makes it easy for me to find what I’m looking for, and I can also take inventory of how much I have on hand at a glance. It also means I can send my children out to the freezer to get things for me, since I can tell them exactly where it is. That’s a win/win scenario. Can you believe that 30 pounds of ground beef fits so nicely in that container? 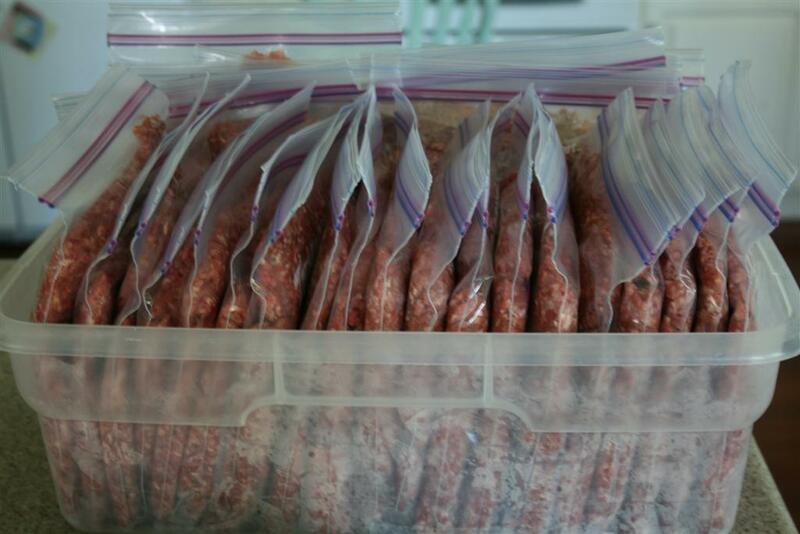 Now it’s all in the freezer, ready to be used. I know that a lot of things can give us peace of mind. This is a big one for me. Knowing that we have food on hand is huge. Buying it at a good price makes me feel even better. I do this with everything. I have only bought chicken twice in the past 14 months. Both times I found it at a great price, $1.29/pound. I buy a lot and then we use it while I wait for the next great sale. I feel like this has three advantages. 1. I have a lot of food on hand. 2. I keep track of how much I buy and can then look back and see how much we really use over a period of time. It helps me predict how much to buy the next time I find that item on sale. 3. Because I’m buying at a great price, my money goes farther. My grocery budget isn’t being eaten up by high prices. When I leave the grocery store my cart is usually full, but there’s not much variety. When I found name brand barbecue sauce on sale for 59 cents, I bought ten of them. When I found Italian salad dressing on sale for 68 cents, I stocked up. When I found cheese on a great sale, I bought enough to last us 4 months. A majority of my grocery money that week went to cheese, but it meant I could buy other items for several months while we used the cheese I had on hand. If I’m not sure how much I need, I buy ten. On any given week I come home with only a couple of bags full of fresh produce and other items I needed only one or two of, such as ingredients for a new recipe I plan to try. The rest all goes to storage. I love living this way. To me, it just makes sense. And that’s how I shop for my large family. (In case you ever wondered).